You are here: Home>People>Tribute to John Joe Maher R.I.P. Frank and I were so sorry to learn of John Joe’s death in August 2013. While we knew he wasn’t well yet when death comes knocking it takes us all by surprise. Many memories of times past come flooding back. One always thought that John Joe would always be with us as he was always in control – organising events and golf outings as only he could, paying attention to every little detail. It seemed so effortless to him. His greatest delight was bringing pleasure to his many friends and acquaintances. He was jovial, generous, upright and honourable. He was truly a man of great integrity, a good man who used his talents wisely for the benefit of his fellow man. The Good Lord will indeed reward him for his goodness. We in Oughterard Golf Club – in fact in the village of Oughterard are indebted to him as he brought his first group of Fruit Traders here in 1976 and continued to do so well into the 90’s. He put us on the map with other Dublin Clubs and this brought great business to the village. We had some hilarious nights in the Golf Club enjoying barbeques, barn dances, sing songs and dancing into the early hours of the morning. We enjoyed ourselves while John Joe looked on quietly amused at the antics around him. Anyone who knew John Joe and was counted among his friends was privileged. We will miss him. Death ends a life but relationships live on and for as long as we live John Joe will be part of what we are and we will remember him. The bonds of love can never be broken. John Joe’s life’s work is now completed and we now pray that the Good Lord will welcome him into his kingdom and reward him for his goodness. This page was added on 02/11/2013. A Tribute to John Joe Maher RIP, delivered by Ted Corcoran, Captain, Forrest Little, in Forrest Little G.C., August 10th President Joe, Forrest Little, Captain Pierce, Oughterard, Nora and Alice and John Joe’s extended family, Members of the Golfing Union of Ireland, Visitors, Friends, Ladies and Gentlemen. I would like to welcome you all to Forrest Little today, as we gather here as relatives and friends of the late, dearly beloved, John Joe. On behalf of all the members of the Club, I would like to express our sincere sympathy to Nora and Alice and the extended family members on their sad loss. John Joe was a special human being, widely known, not only in golfing circles all around the country, but also in many other facets of Irish life. He was such a special figure here in Forrest Little, that, when word spread of his passing early on Wed last, nobody, but nobody, said John Joe who? Everyone knew who John Joe was and was saddened by the news. An air of gloom hung over the club all day, as person after person whispered to one another, “did you hear about John Joe?” Henry W Longfellow, an American poet, in his well known poem, The Psalm of Life, wrote as follows: “Lives of great men all remind us We can make our lives sublime, And, departing, leave behind us Footprints on the sands of time.” John Joe was a great man in so many ways and his footprints will be forever etched on the memories of all the very many people who knew and loved him. John Joe became a member of Forrest Little G.C. in its early years and went on to serve as Captain in 1984, before serving as President in 1996 and 1997. During the intervening years, Oughterard became his home from home, mainly because of his fishing interests and where he formed lifelong friendships. It’s wonderful to see so many Oughterard members here today at his funeral, a fact, no doubt, much appreciated by Nora and Alice and all his Dublin friends. As Oughterard grew in tandem with Forrest Little, John Joe set up a twinning arrangement between both clubs. Inter club visits were arranged twice yearly and these proved wonderful social occasions, always ending well before midnight! Sorry my mistake! Before morning! 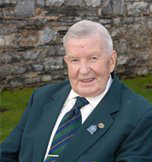 Both Forrest Little and Oughterard Golf clubs, in recognition of his huge input and contribution to both clubs, afforded him Honorary Life Membership, awards he greatly appreciated and savoured with great pride. John Joe always showed a keen interest in promoting juvenile golf, so it must have been particularly satisfying for him to learn of his grand niece, Julie McCarthy, winning the Irish Girls Close Championship in Ballyliffin G. C. just a few weeks ago and her subsequent selection on the Irish Girls team for the Home Internationals. In 1997, John Joe was elected to a position in the Golfing Union of Ireland and travelled the length and breadth of the country, officiating at various competitions. He was a familiar figure at first tees, from early in the morning till late in the evening, carrying out his duties in is his usual fastidious and efficient manner. As a member of the GUI, John Joe captained a winning Leinster Boys Interprovincial side, in 1999, and would have been delighted to hear that the Leinster Boys team has once again won the Interprovincial title, a week or so ago, this time captained by another Forrest Little and GUI member, his very close friend, Kevin Raftery. Someone unknown once said, “We do not remember days. We remember moments in our lives.” Everyone here can remember such moments, involving John Joe. My most recent moment happened on the morning of July 6th, my Captain’s Prize, Final Day. John Joe phoned the bar and asked to speak to me. He sounded tired and weak, but he still found the energy to call me and wish me every success on the day. I’m told he did this religiously for every captain on his final day every year. It was typical of John Joe, always thinking of other people. You have all experienced such a moment, or moments, involving John Joe; moments of kindness, moments of generosity, moments of friendship, moments of camaraderie, moments of helpfulness, moments of solace, moments of support, moments of happiness, moments of enjoyment. While I pause for a second, or two, I ask you to recall such a moment. I thank you for coming here today in such large numbers. John Joe has received the send off he deserves. I once again sympathise with Nora and Alice and reassure you that his legacy will live on, because he truly was a special person. As the late American sports writer, Grantland Rice, put it so beautifully, writing about the day when all of us meet our maker, as we must; “For when the One Great Scorer comes To write against your name, He marks – not that you won or lost- But how you played the Game.” John Joe never cared whether he won or whether he lost – he was more concerned with living a good life and helping everyone he could. Thanks John Joe. We will miss you. May you rest in peace. Ar dheis lamh De go raibh a anam dilis.